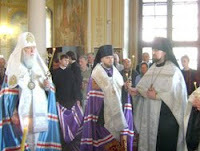 Patriarch Filaret (Denysenko) of the independent Ukrainian Orthodox Church and his auxiliary, Bishop Ahapit of Vyshhorod, have served a memorial in Kiev's Church of the Nativity for the repose of the famous Ukrainian poet Taras Shevchenko on the occasion of the 150th anniversary of his reburial in the church. In attendance were several Ukrainian politicians and the famous soccer player Andriy Shevchenko. More here.